ninja kitten: Testing, Ding, Ding, Is This Thing On?! Hey, thanks to the advice you gave me, in like, March, I decided to finally combine my love of my son, N, and my crafting. I will now have one blog. If you are following two blogs, or two feeds, might want to get rid of one of them since they'll probably be a bit redundant. On the other hand, my book review blog is finally getting some posts written because I've decided to take it more seriously. No lie, I've posted to it ten time or more this month. Either way, I've got some crafting stuff to post. 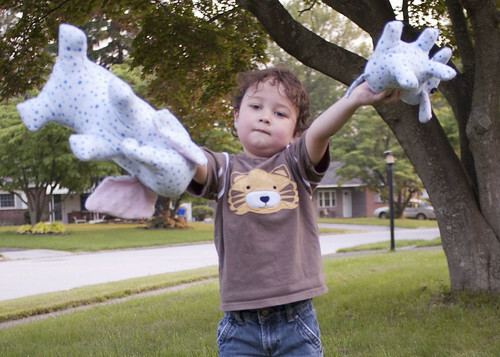 I made my son some stuffed elephants. I knit a blanket. I broke my Lantern Moon sock needles and now have half an effing sock sitting in my WIP bag. I hope this works. It's working. :) Glad to see you're back!